Ongeag Guesthouse - Clarens Accommodation. 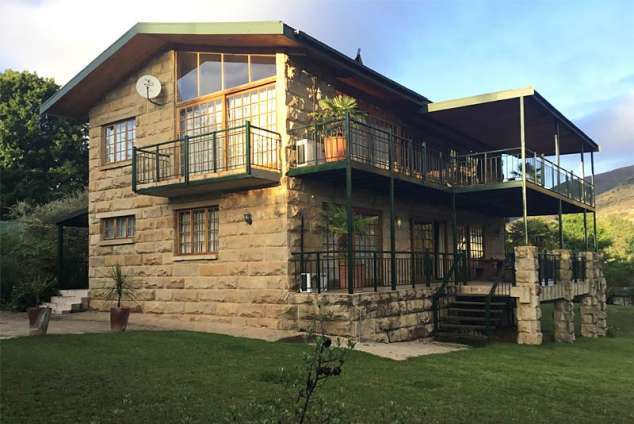 Ongeag Guest House is a spacious, fully equipped double-storey sandstone house, surrounded by the mountains of Clarens. For nature and hiking enthusiasts, Clarens is the place to get away from busy city life. Wide balconies integrate the warmth of the house with splendid views of the surrounding scenery. The house is designed to make the most of natural lighting and its interior decoration reflects the calming hues of its surroundings. The house has three well-appointed bedrooms. The large main bedroom sleeps four (a queen size double bed, a double sleeper couch) and is en suite. The bathroom is tiled with under floor heating. Large windows provide this room with warm natural light, and two balconies afford an uninterrupted scenic view. It has under carpet heating and airconditioning. The second bedroom has a double bed, and is fitted with a sitting and study area. It also has access to the upper balcony with eastern views of the Red Mountains as well as the Maluti Mountains. Access to the en suite bathroom of the main bedroom is through the upstairs passage. This room also has airconditioning and under carpet heating. A third bedroom en suite is situated downstairs and can sleep three ( a double and single bed). This bedroom has access through cottage pane sliding doors to the lower balcony. Both the bedroom and bathroom are tiled with under floor heating. This room is also airconditioned. The combined lounge/dining room and living area has an open fire place, DStv and under floor heating, and opens through wide sliding door onto the lower balcony. There is a choice of either using the portable braai on the lower balcony or the sandstone braai in the garden. Double lock up garages with an internal staircase to the living area completes the picture of this heavenly home. 40105 page views since 12 Jun, 2007.